America's Better Business Bureau A+ Source for dog antler chews. Cheaper by the Pound! Welcome to AMERICA's antler dog chew EXPERTS! "Jakey" loves his elk antler chews! AMERICA's Original Antler Chew EXPERTS since 2004! The LOWEST DOG ANTLER CHEW PRICES ON THE NET! OUR CHEWS ARE BIGGER (2X), BETTER & CHEAPER! NOW WITH FREE SHIPPING! 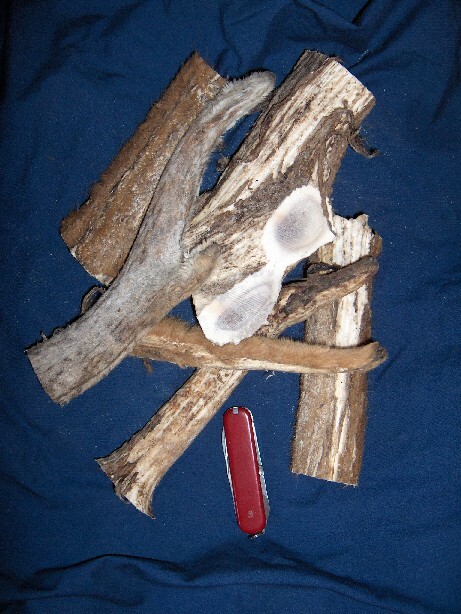 Antler Chews by the pound are much cheaper than antler chews by the piece. Check it out! LESSER orders will receive guarenteed UPS flat rate shipping and handling for $9.95 PER BOX to street addresses only. BUY IN-BULK FOR A BETTER DEAL! 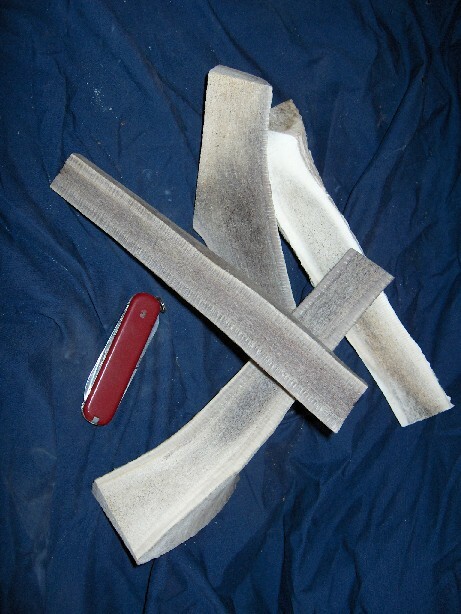 ELK ANTLER CHEWS and WHY DOGS and their OWNERS LOVE THEM. We are America's direct source of all-natural, all-American dog ANTLER CHEWS. Antlers are an annually renewable animal cartledge and bone tissue only generated by members of the DEER family. Generally, only males (bulls and bucks) grow antlers every year, however Caribou (Artic deer) females also carry antlers As a major national supplier of deer meats, Grande Natural knows deer. All-natural antler dog chews come predominately from Rocky Mountain ELK and some other deer species like mule deer, whitetail, red deer, moose and fallow deer. Hard antler is an annually renewable crop that naturally FALLS OFF the deer, providing a safe, all-natural antler chew treat for your dog. Every year, deer drop their old hard antler in late Winter and start growing new antlers (velvet antlers) each and every Spring. We collect the natural "drops" from farmed and wild animals, or gently and humanely surgically harvest the hard antler off farmed deer in the Fall. Removing antlers from farmed deer minimizes the risk of injury as the bulls or bucks evolve into the aggressive annual rut or mating season. NO ANIMALS ARE EVER HARMED. 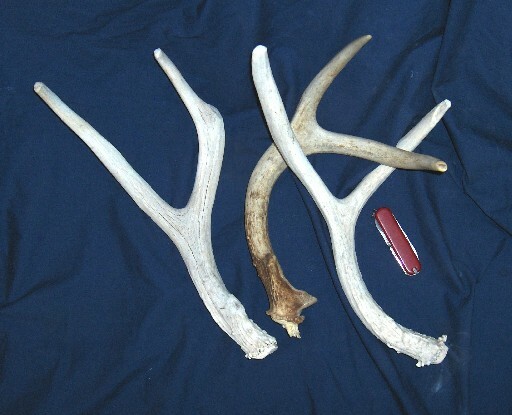 In a farm situation, hard antlers left on males can be deadly weapons against predators, other males or even humans. We have chosen to specialize in American Elk as our major source species all though we do use Moose, Red Deer, Fallow Deer, Whitetail Deer and Mule Deer and lastly Caribou (reindeer) antlers as well. All our antler dog chews are all-natural as they come from wild animals or from farmed animals that are never given any steroids, unnecessary antibiotics or other growth promoting chemicals. Natural dog antler chews are much longer lasting than rawhide or synthetic chew toys, even longer than raw bones. 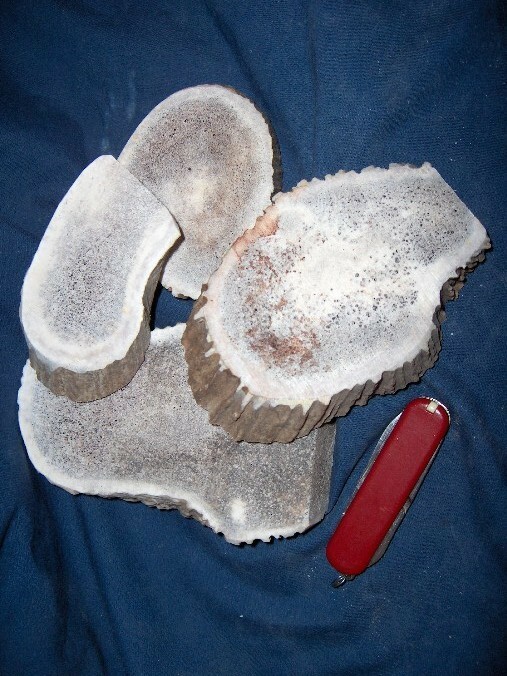 this is due to their high calcium content of these bone-like natural growths. Deer antler chew toys contain many of the best nutrients that your dog craves. A great natural source for calcium, phosphorus, potassium, sodium, magnesium, iron, zinc & manganese. All this in a compact, odorless and mess-free, all-natural dog chew form. Your dog will love em. Being hard antler exposed to the weather, Antler Chews are stronger than raw bones and are of a finer texture. 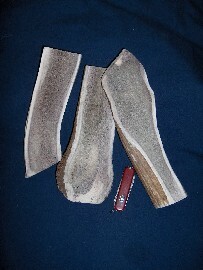 Antler Dog Chews cut from real hard antler will not easily break or chip like cooked or raw bones might. Each dog antler chew is different, as is each dog that loves them, hence, it is hard to predict how a dog will consume them. Your dogs chewing action and the digestive action of the dogs own saliva slowly yields delicious morsels of antler for your dog to enjoy. Deer antler chew toys are long lasting, tasty and safer for your dog! So its easier for you to reward your favorite pet. However always use caution when first offering your dog an antler chew treat. Supervise their activity so they do not attempt to swallow or break the antler. Always buy antler chews approximately proportionate to your dogs body size. Our antler chews for dogs are all-natural products right off the animal. Every antler is different, hence each of our antler chews is different. That difference maybe why dogs find them irresistible. Our only processing on the whole antler is to power-wash with clean, natural mountain well water to remove excess dirt and miscellaneous organic material and then to cut the dog chew into manageable sizes and slice in half if desired by the customer. 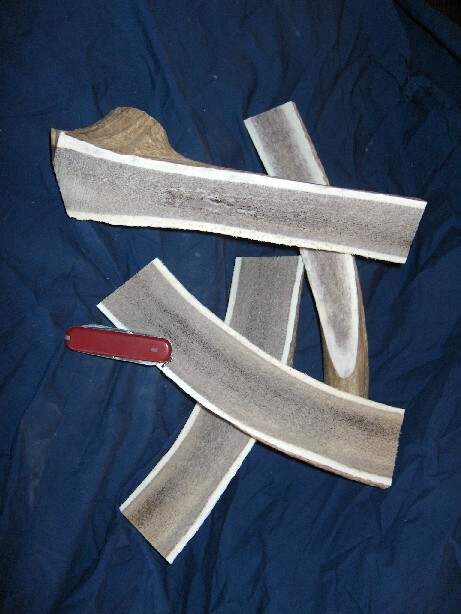 Each dog chew antler is hand-sanded to round the points and eliminate any sharp edges that might injure your pet. Additional antler cleaning may be necessary in your particular environment. 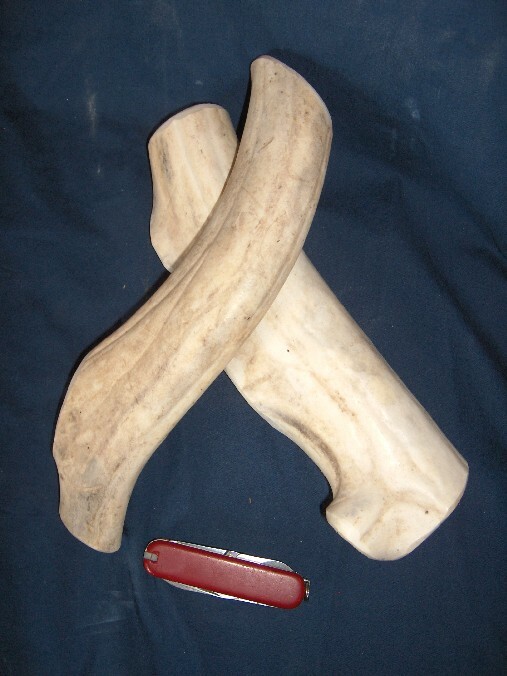 We offer dog antler chews for sale in several sizes (Chihuahua-sized, small, medium, large and Mastiff-sized). Just simply match the size of the antler chew stick to your dogs size. Slicing reveals the antler chews marrow which dogs love, but in turn reduces the time it takes for doggy to consume the dog chew. Sliced dog chews do however have a greater risk of splitting and sharp edges if very aggressively chewed. Some antler chews may have residual velvet antler fuzz. This is not harmful in anyway. While strange-looking, this fuzz is natural skin with hair, and not a worry at all for your dog, they may actually prefer the fuzzier ones! We have a special catagory of Fuzzy antler chews! Unfortunately, fuzzy antlers are not at all typical of hard antler and are subject to shortages. Dispose of any dog chew which represents a risk of swallowing by your pet. 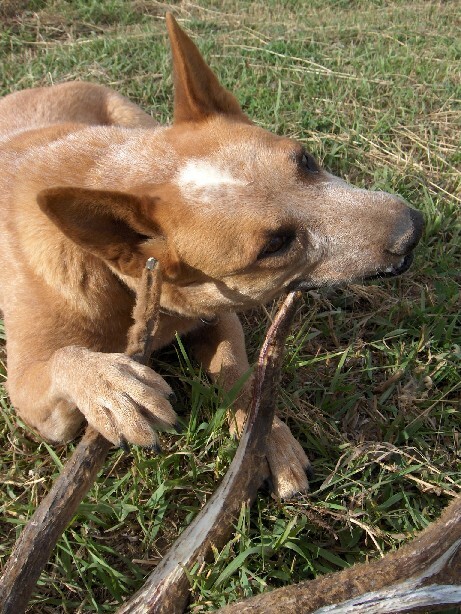 * Like for any new chew toy, ALWAYS supervise your dog when giving antler chew sticks or buttons. * Do not allow them to try and swallow them or break them in half. * These natural antler chews are very hard and can break teeth if too aggressively chewed. 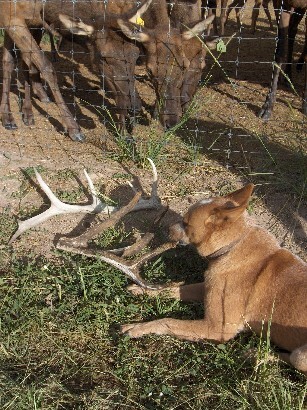 * Some dogs get overly possessive of antler dog chews. *Use caution when taking an antler chew toy away from your dog. Grande Natural disclaims any liability for pet problems due to natural instincts, failure to supervise or aggressive behavior. CAUTION: Hard Antler chews are an all natural, raw product right from the animal. They can be part of a bones and raw food diet, but have the same risks that are associated with all RAW products. Please supervise your pet as to his chewing behavior. SHIPPING: All retail chew product orders over $75.00 ARE FREE UPS SHIPPING except HI and AK. Other orders may have fees and will receive guarenteed UPS flat rate shipping and handling for $9.95 PER BOX to street addresses only. We will ship your order immediately by United Parcel Service (UPS) without charge nor telephone call. 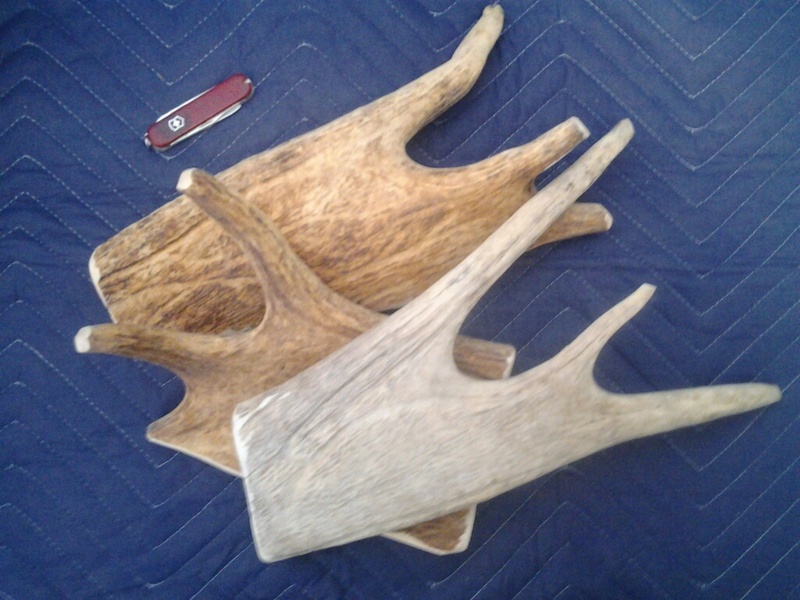 ALWAYS SUPERVISE YOUR DOG WHEN FEEDING HARD ANTLER TREATS SCALE on All Pictures: 3" Pocketknife Choose a size appropriate for your dog. 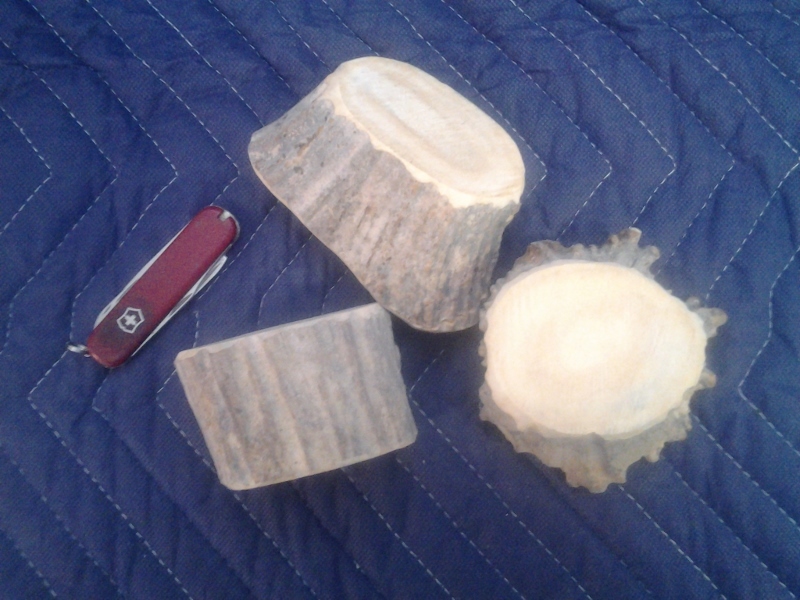 MINI-sized Hard Antler Elk / Deer Chews generally less than 1 inch diameter and ~ 4 inches long (2 lb. minimum purchase) These chews are our smallest ALL-NATURAL DOG CHEWS for the smallest of breeds. 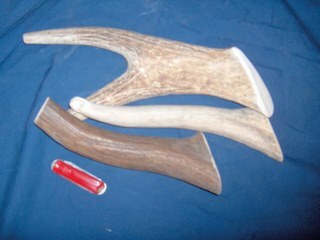 Not for medium or larger dogs due to swallowing risk All sharp antler tips are rounded. Net antler weight in picture 0.94 lbs or ~0.32 lb. per piece EZ TO HOLD & CHEW ! Pocket Knife is 3" long ECONOMY MINI "Footers" Elk or Deer Hard Antler CUT LONGER, up to 1.00 inches diameter but 8 to 12 inches long! LASTS TWICE AS LONG! (2 lb. minimum purchase) LONG LASTING All sharp antler tips are rounded. 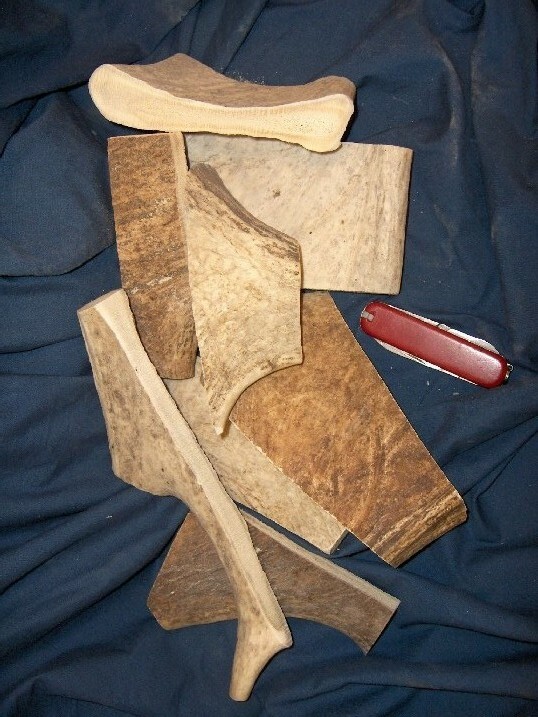 Footers may sometimes include the antler bases just off the animals head. 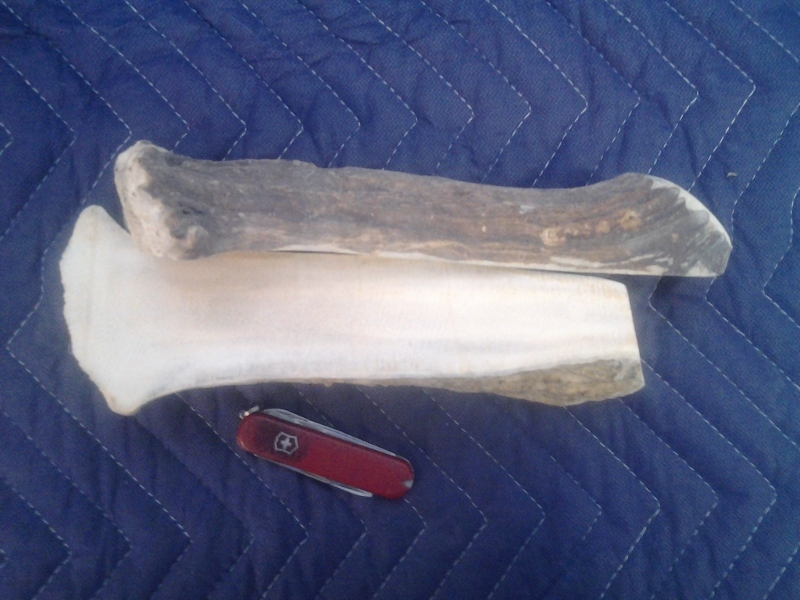 Net antler weight in picture 2.00 lbs or about 3 oz per piece Pocket Knife is 3" long SMALL Elk or Deer Hard Antler Chews generally less than 1.25 inches diameter and +/- 3 to 6 inches long (2 lb. minimum purchase) EXCELLENT Small-sized ALL-NATURAL DOG CHEWS! LONG LASTING All sharp antler tips are rounded. 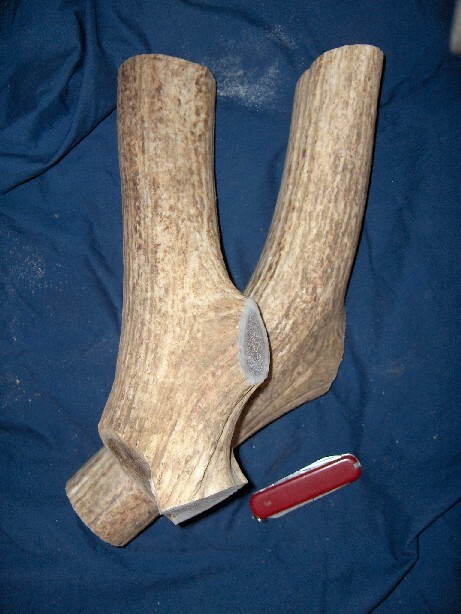 Net antler weight in picture 1.72 lbs or ~0.57 lb. per pieceEZ TO HOLD & CHEW ! 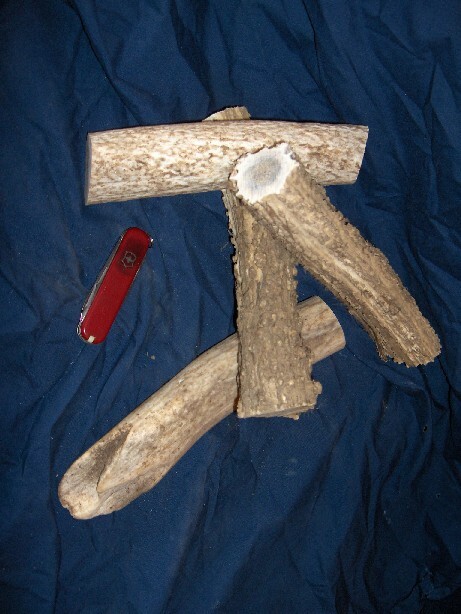 Pocket Knife is 3" long ECONOMY SMALL "Footers" Elk or Deer Hard Antler CUT LONG, generally less than 1.25 inches diameter but 10 to 12 inches long! LASTS TWICE AS LONG! (2 lb. 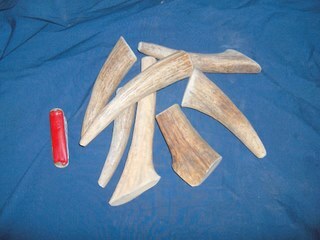 minimum purchase) LONG LASTING All sharp antler tips are rounded. 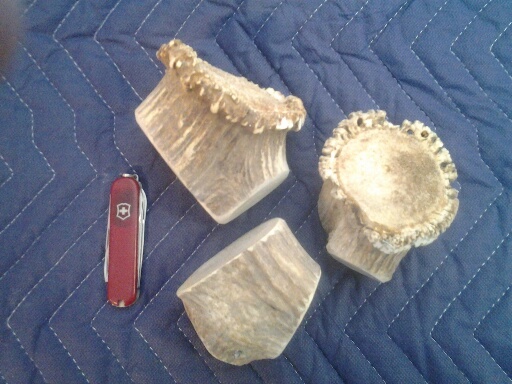 Footers may include the antler bases just off the animals head. FOR INSTANT BURSTS OF FLAVOR ( and A GOOD STARTER TREAT), sliced antler is a great choice, however it can be chewed up faster. Consider limiting your pet's chew time. 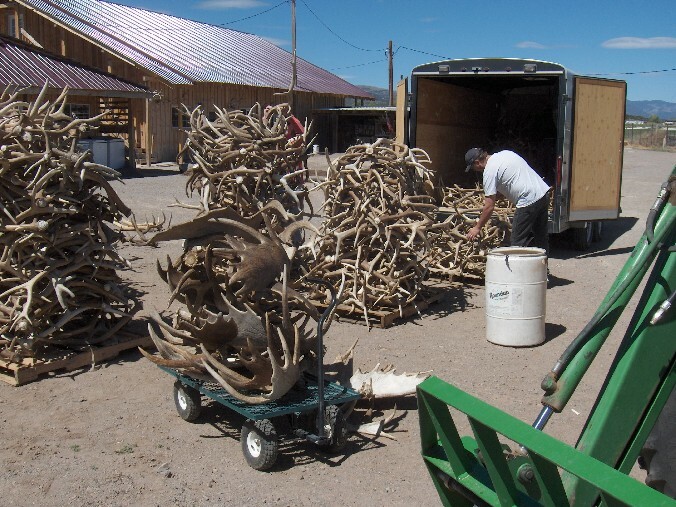 Requests for specific sizes, colors or grades of antlers can incur an additional handling charge. SLICED SMALL Elk or Deer Hard Antler pieces (2 lb. minimum purchase) SLICED DOWN THE MIDDLE TO EXPOSE THE DOGGY-DELICIOUS MARROW! LONG LASTING. 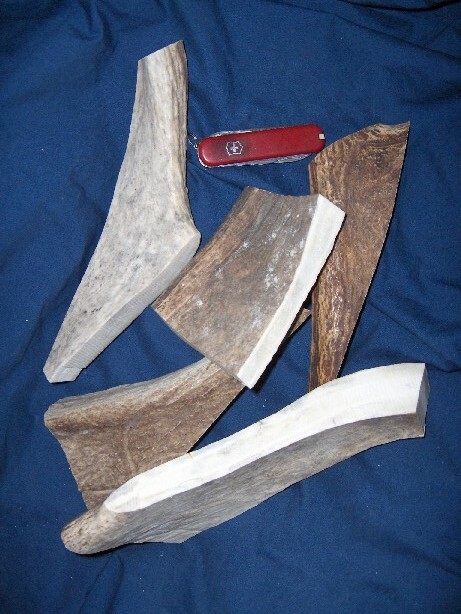 SLICED MEDIUM Elk or Deer Hard Antler pieces (2 lb. minimum purchase) SLICED DOWN THE MIDDLE TO EXPOSE THE DOGGY-DELICIOUS MARROW! LONG LASTING. 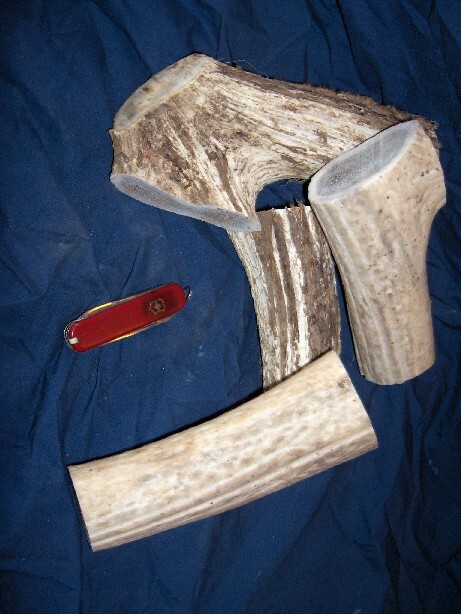 Net antler weight in picture 2.88 lbs Pocket Knife is 3" long SLICED LARGE Elk Hard Antler pieces (2 lb. minimum purchase) SLICED DOWN THE MIDDLE TO EXPOSE THE DOGGY-DELICIOUS MARROW! LONG LASTING. SLICED DOWN THE MIDDLE TO EXPOSE THE DOGGY-DELICIOUS MARROW! LONG LASTING. MOOSE Antler Chews Please Note: Antlers are natural products and can be difficult to classify. 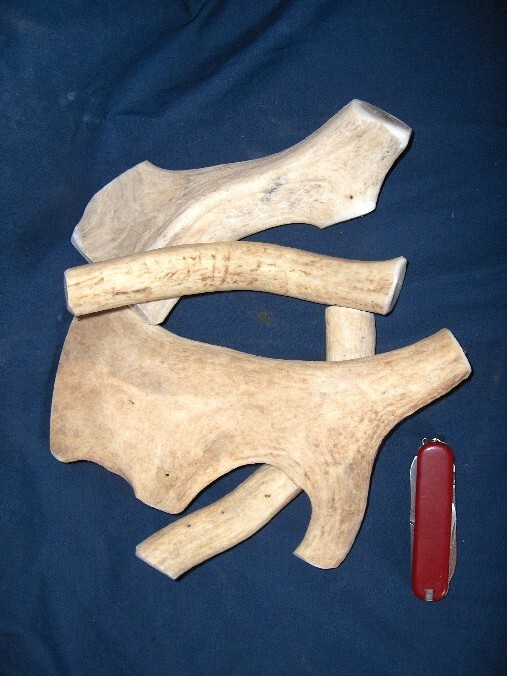 We Categorize by SIZE, however due to variable DENSITY, an antler chew weight can vary considerably. Requests for specific sizes, colors or grades of antlers can incur an additional handling charge. THE PITBULL CHEW, one tough nut to crack! By far the Most DURABLE ANTLER CHEW OF ALL. THE ULTIMATE MARROW-EXPOSED, PITBULL CHEW. Please Note: Antlers are natural products and can be difficult to classify. 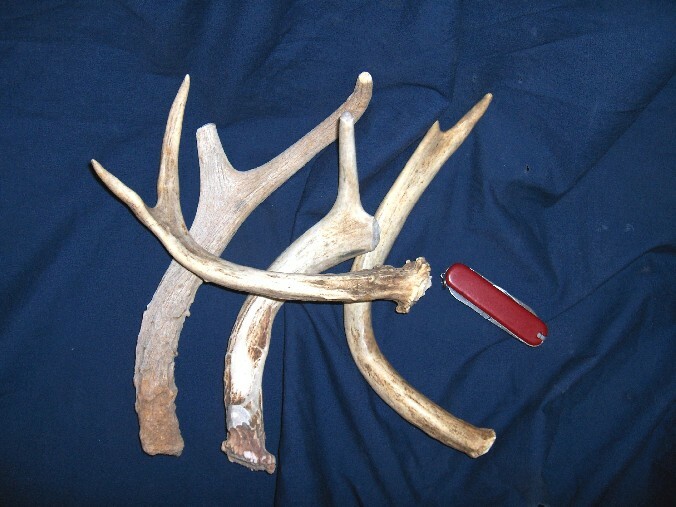 We Categorize by SIZE, however due to variable DENSITY, an antler chew weight can vary considerably. 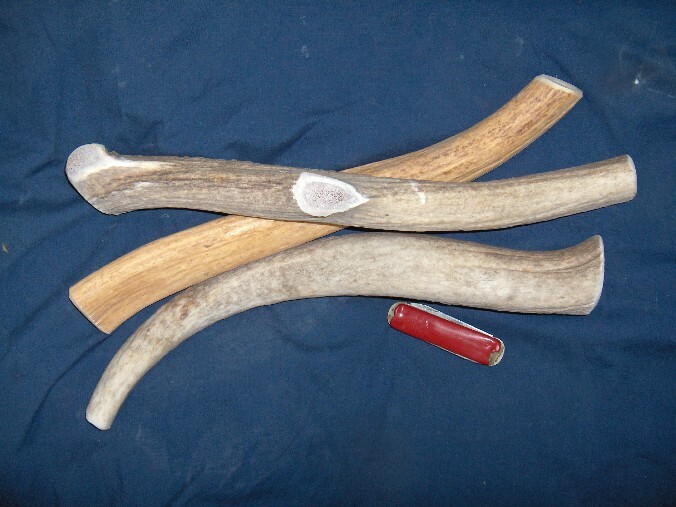 Requests for specific sizes, colors or grades of antlers can incur an additional handling charge. 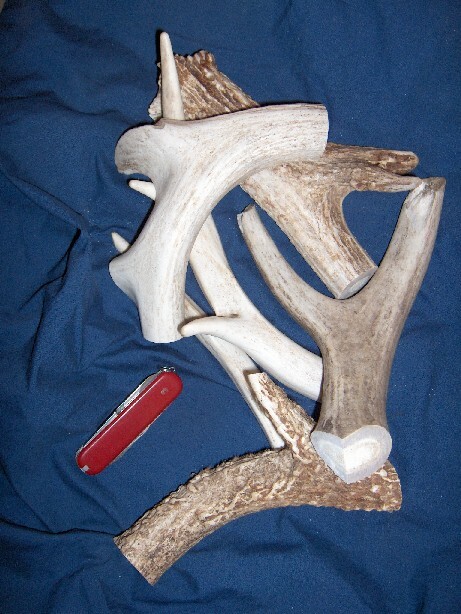 Net antler weight in picture 2.10 lbs or about 6 oz per piece Pocket Knife is 3" long IF you have a small dog, please specify small sizes in the order comments sections. 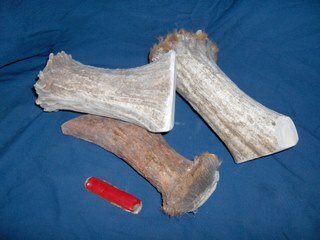 FUZZY Elk or Deer Hard Antler Chews! $3 off the regular price! CAUTION: Fuzzy Antler is early-stage hard antler which may contain very rich marrow. Over eating of Fuzzy Chews can result in digestive problems. Please supervise and limit your pets chewing time. Net antler weight in picture 2.06 lbs Mule deer is Gray, Whitetail is White or brown. Pocket Knife is 3" long Western Comfort MULE Deer Hard Antler Chews variable widths, approximately 4 to 8 inches long Less hard bone, more marrow. (2 lb. minimum purchase) Specify desired sizes in comments section. Net antler weight in picture 1.88 lb. Pocket Knife is 3" long. Picture is of larger beam pieces, Smaller tines are also included. 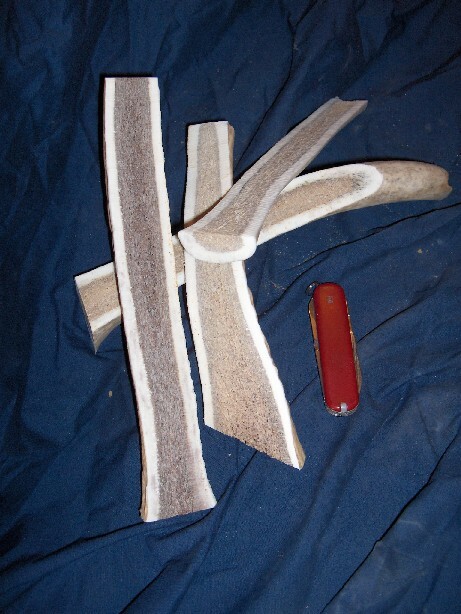 Northern Comfort CARIBOU Hard Antler Chews variable widths, approximately 4 to 10 inches long, on the upper portions, it can be a lighter density deer antler for easy chewing for older dogs (2 lb. minimum purchase) A bit LOWER DENSITY MAKES FOR EASIER CHEWING LIMITED QUANTITIES, please specify upper or lower portions in comments sections.
! 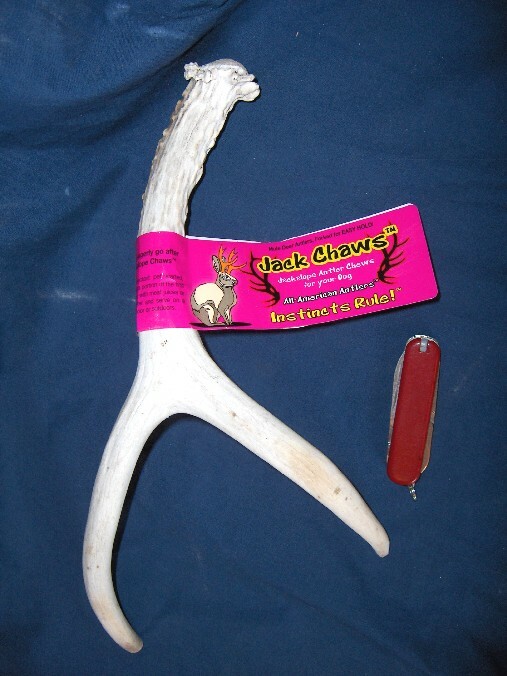 JACK CHAWS� AKA: Small, Whole FORKED MULE or WHITETAIL Deer Antlers, Easier for your dog to HOLD & CHEW ! 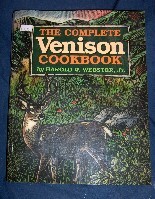 Net antler weight in picture 14 o z. or 4.6 oz per piece. JUNIOR JACK CHAWS� Hard Antler Chews Easy to hold, each piece from 2.6 oz to 4.9 oz each (4 piece minimum purchase) All sharp antler tips are rounded prior to sale. SAFE & EASY for your pet to hold down and chew! Net antler weight in picture 5.6 oz. 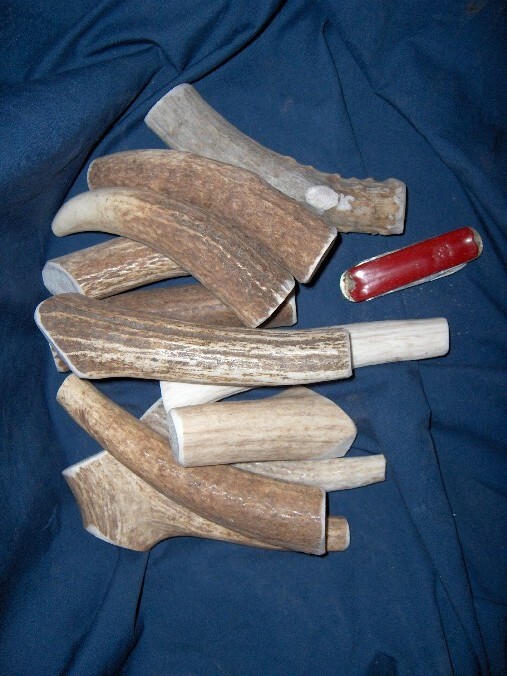 JACK CHAWS� Hard Antler Chews Easy to hold, each piece from 5 oz to 7.9 oz each (4 piece minimum purchase) All sharp antler tips are rounded prior to sale. SAFE & EASY for your pet to hold down and chew! Net antler weight in picture 26.8 oz. or 8.9 oz per piece. 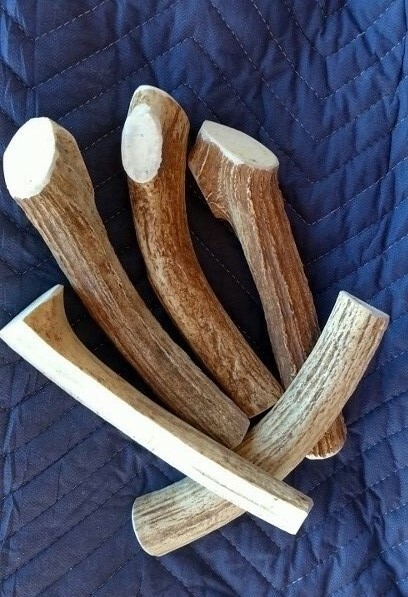 Jumbo JACK CHAWS� Hard Antler Chews Easy to hold, each piece from 8 oz to 11.9 oz each (4 piece minimum purchase) All sharp antler tips are rounded prior to sale. SAFE & EASY for your pet to hold down and chew! Please Note: Antlers are natural products and can be difficult to classify. We Categorize by SIZE but sell by weight. 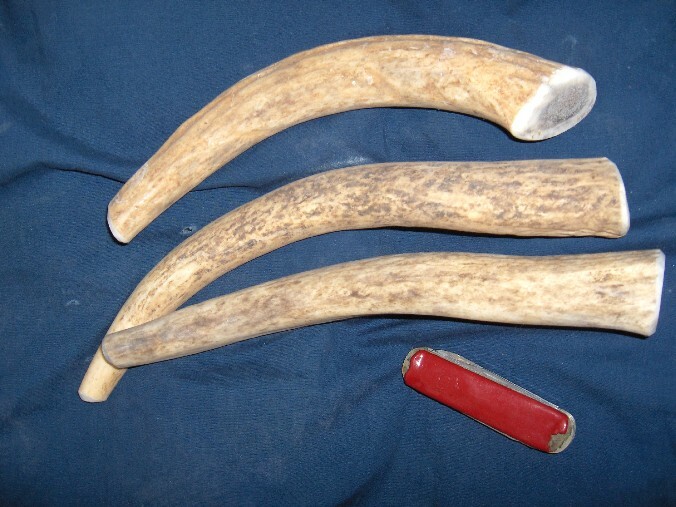 However due to variable DENSITY, an antler chew weights can vary considerably. Long-lasting for weeks instead of days Residual antler buttons remaining after the Velvet Antler harvest or the cutting of antler chews. SHIPPING: All retail chew orders over $75.00 ARE FREE UPS SHIPPING except HI and AK. Other orders may have fees and will receive guarenteed UPS flat rate shipping and handling for $9.95 PER BOX to street addresses only. We will ship your order immediately by United Parcel Service (UPS) without charge nor telephone call. 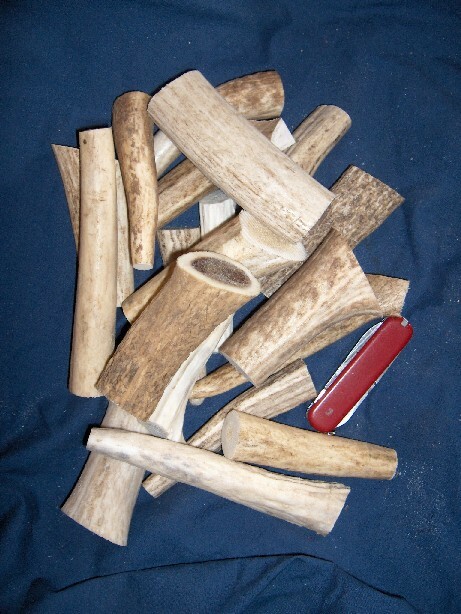 Net antler weight in picture 2.20 lbs Pocket Knife is 3" long LARGE Elk BULLY BUTTONS� IN BULK (2 lb. minimum) Approximately 2.5 to 3.5 inches in diameter. A WHOPPER OF AN UNUSUAL, ALL-NATURAL DOG CHEW! VERY LONG LASTING, Round, easy to gnaw on. THIS WEBPAGE IS NEITHER AN OFFER TO SELL NOR A SOLICITATION TO BUY ANY PRODUCT IN ANY LEGAL JURISDICTION WHEREBY THE SALE OF SUCH A PRODUCT MAY BE ADVERSE TO LAW. NO ADVERTISED ITEM IS INTENDED FOR SALE IN THOSE AREAS WHERE LOCAL RESTRICTIONS MAY LIMIT OR PROHIBIT THE PURCHASE OR POSSESSION OF SUCH PRODUCTS. When buying our products you are purchasing those products here in Colorado where wild and farmed antler sales are legal. We then ship that personal product to you via UPS at your direction. 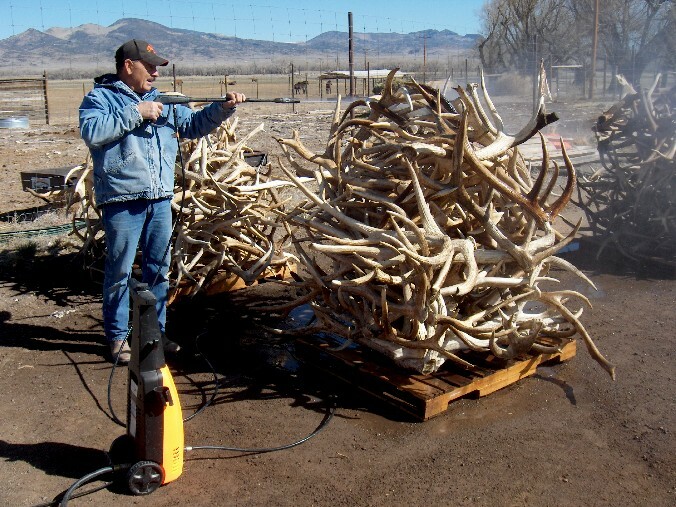 The customer is responsible for their own state laws and local regulations in regards to buying and possessing wild and farmed antler products. or Email us for questions regarding any of our Products.